When you are stressed and poor make this soup. Why? Because you will instantly feel warm and rich after just a couple bites and the ingredients needed to make it are soo cheap that you won’t compromise your budget and it makes loads! So here was the big idea, I have some left over crusty wheat bread from another meal what can I do with that? 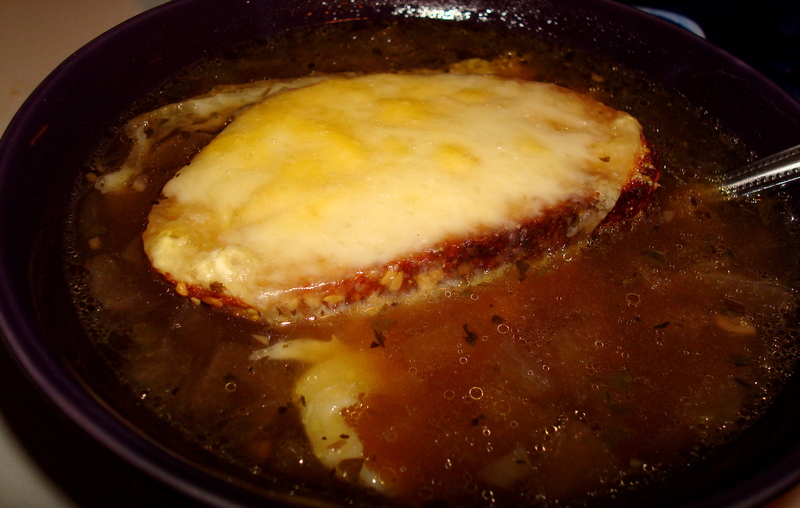 Hmmmmmm, Oh yes, what about the delights of French onion soup? I must admit to being fully smitten with the crock of onion soup served at a recently deceased Irish restaurant chain so this idea seemed like a good one. I made my own attempt with very little help (I did glance at this recipe). 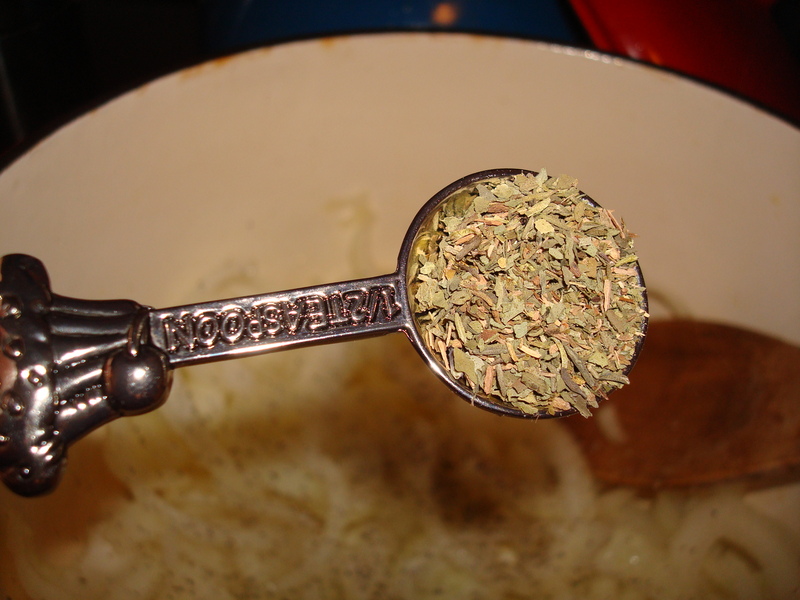 I decided to stay simple and use up a few ingredients I had been stock piling (What? When good quality broth in a box is on sale you get a case too, right?). So… survey says? This was a knock out! It was creamy because of the slowly stewed onions and it was rich because of the glug of marsala wine I had hanging out by the stove. All in all I was euphoric until I stepped outside and realized it wasn’t the cool 50 degrees outside I had conjured up in my imagination while slurping my soup. 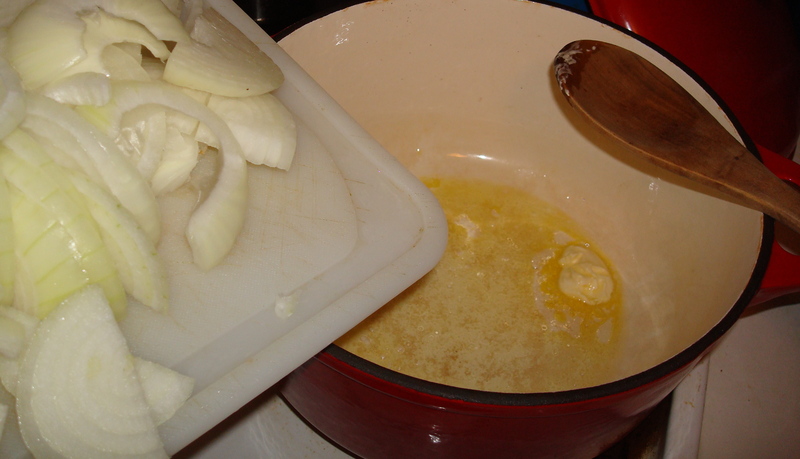 – Melt butter in a large soup pot or Dutch oven (you’ll need a lid) over med-high heat. 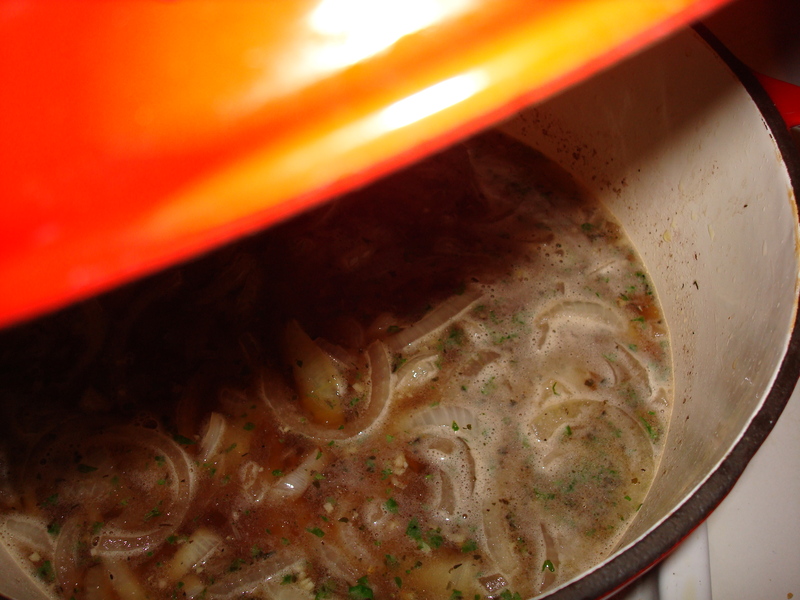 -Add stock, bouillon, and pepper and bring up to light boil. -Reduce heat to low so that soup can simmer with lid cracked for at least 30-40 minutes (if you can give it an hour or two it will only be better). – ladle about 2 cups of soup in a bowl and top with cheese topped bread, let it rest for at least a couple minutes before eating. This entry was posted in People Food and tagged cheap eats, easy meal, easy recipe, fall dinner, fall recipe, french onion soup, soup by Angie. Bookmark the permalink.